THE Molesworth Cricket Club closed the 2015/16 season with its annual dinner and trophy night at the Star and Garter Hotel recently. With about 50 members and guests in attendance the evening was enjoyed by all. Dean King and Sam Triffitt cleaned up 10 trophies between them, which included the Danny Godfrey Memorial Trophy in their respective both grades. Another highlight was the awarding of life membership award to club stalwart Nick Piuselli. Piuselli has been a loyal and tireless member of the club for the past 13 seasons and for the past two years has guided the club as president. Piuselli has also contributed on-field, playing many games including the 2014/15 2nd Grade premiership. Life members in attendance were Dion Hay, Sean Hay, Tony Hall, John and Carol Hutton. The club would thanks all trophy donors and sponsors for their ongoing support which makes a huge difference to every season. First Grade - batting average: Dean King 41.0; Batting aggregate: Jamie Adams 254 runs; Bowling average: Dean King 16.94; Bowling aggregate: Dean king 16 wickets; Fielding award: Brad Ransley. Danny Godfrey Memorial Trophy: Dean King. Second Grade - batting average: Sam Triffitt 21.08; Batting aggregate: Sam Triffitt 274 runs; Bowling average: Sam Triffitt 20.88; Bowling aggregate: Sam Triffitt 17 wickets; Fielding award: Daryl Kenyon. 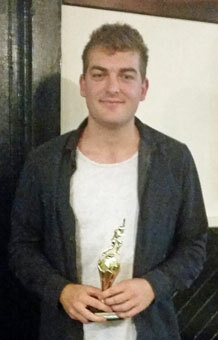 Danny Godfrey Memorial Trophy: Sam Triffitt. Other awards - coaches award: Jake King; Best Under 21: Cody Neads; Duck trophies: Nathan Eiszele and Sam Triffitt; Life membership: Nick Piuselli; Best clubman: Brayden Hodge.